I like the people and the diversity of Riverwest. Artists are everywhere, said. 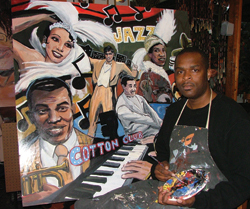 Eddie Davis, who produces portraits, murals, sculpture and other public art in his studio at 808 E. Clarke St. He has worked out of the Clarke Street studio for three years. Before that, he had a studio on Locust Street. He grew up in Milwaukee and has been living in Riverwest for fifteen years. Most recently Davis is becoming renowned for his murals. His work graces the walls of many Milwaukeearea schools. He did a Harlem Renaissance piece at North Division High School (1011 W. Center St.) and a George Washington Carver mural at the Carver School on Maple. Both of the murals took months. The Carver School piece is immense. A larger-than-life George Washington Carver looms over the auditorium, surrounded by his many inventions in a sea of pacific blue. The mural testifies to Carvers grand contribution to science and history, as well as Daviss determination and skill. Incredible details of the agricultural chemist leap out towards students. Images of this celebrated black scholar may serve as motivator to the school children. Davis is outgoing and resourceful. He can do a portrait or caricature in minutes. I like doing festival work, but its hard. You have to hit a home run every time youre at bat. He also has created amazing murals for people in their homes, including a Winnie the Pooh nursery. Hes illustrated childrens books, as well. His most recent project is a mural of the Tuskegee Airmen of World War II, the nations first black military airmen, at the Milwaukee Academy of Aviation, Science and Technology. Davis also worked on the community paper, The Press, for three years. He wrote about Milwaukee art and did editorial cartoons and covers. He worked in the school system before starting to do his art full-time. His job in school safety allowed him to express himself creatively: he wrote a booklet entitled Official Handbook on How to Survive Middle School for kids at Walker International Middle School (1712 S. 32nd. St.). This booklet contained detailed illustrations of kids in safety-related situations, and included thoughts on everything from having personal style to surviving gossip to not getting ripped off. Find out more by visiting Eddys website, www.koolazzart.com.